ABSTRACT: The distribution of living (rose Bengal stained) Eggerelloides camaraensis Sousa, Kaminski and Yamashita n. 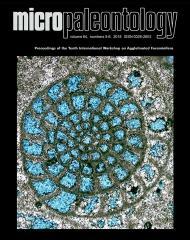 sp., an agglutinated benthic foraminiferal species, is described in the area of the Campos Basin (southeastern Brazilian continental margin). The study is based on 14 oceanographic stations (26 samples), located between 400 m and 1,300 m water depth. The distribution density of living E. camariensis n. sp. is compared to sedimentological parameters, such as grain size, total organic carbon, total nitrogen, calcium carbonate, phytopigment, lipids biomarkers (sterols, fatty acids and n-alcohols), total lipids, and bacterial biomass, as well as the particulate organic matter flux to the seafloor. This species was found only at around 480 m water depth at the head of the Almirante Camara Canyon. Its distribution seems to be related to the influence of Brazil Current conditions.